Only 56 days until ToyCon UK opens its doors again! One of, if not the only dedicated designer toy/art convention in Europe. Tickets already on sale and exhibitors list announced HERE. 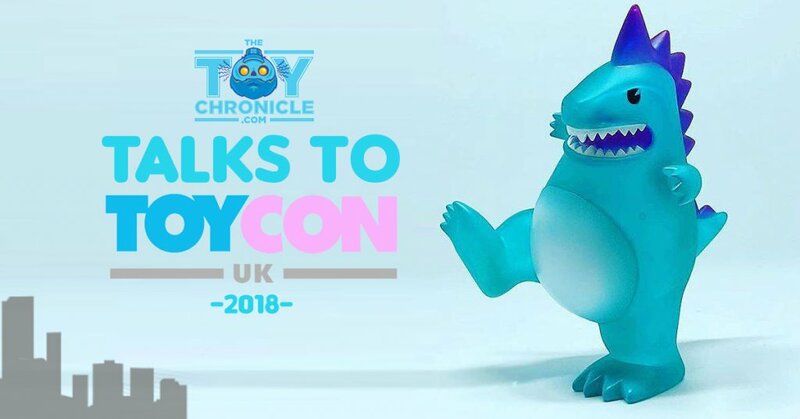 We sit down with Ben & Blair from ToyCon UK team to see whats in the pipeline for TCUK 2018 and ask a few questions of whats happening this year. 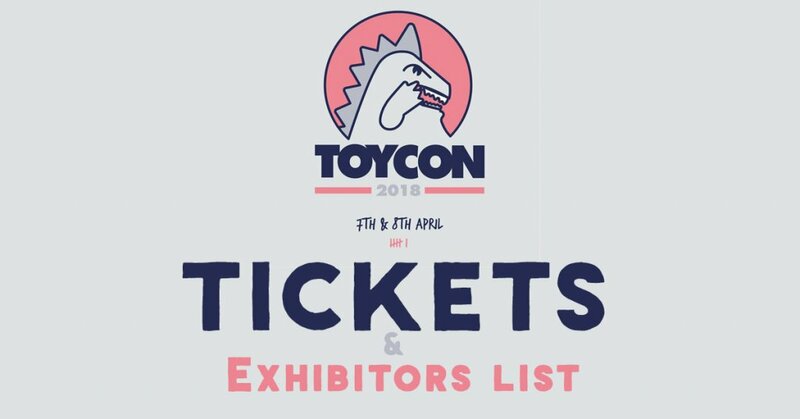 TTC: You’ve released the exhibitor’s list and more big guns are heading to ToyCon UK from around the world like INSTINCTOY and the return of 1000Toys. Has it been a headache trying to decide which vendors to accommodate as we know the list of applicants was overwhelming again this year? Ben: We do always work on a first come system with applications. But the process does usually weed out the not so serious applicants. It is a nice headache to have though, but the huge response has been awesome. We sold out space faster than any previous years. Plus, with the inclusion of the companies you mentioned does show that we have a broad appeal and are reaching around the world! We also think hosting such an international array of talent really helps promote the whole scene rather than a small slice. This gives people a chance to grab toys that they normally just see as exclusives for other shows. Blair: There definitely are more applications each year and we still receive a couple a week at this point in time. Most artists are quick to reply and participate but we do get a few that drop out or fail to pay for their invoice and we continue to move down the list. TTC: One the charms of ToyCon UK for us is the smaller, lesser-known artists that join ToyCon, this year it seems we can expect a bigger mixture of vinyl, resin/ soft vinyl, plush and high-end figures, any vendors you guys are excited to see for the first time at ToyCon? Ben: We always look forward to seeing who has applied and it is always heartening to not just see older faces, but that we have so many new artist and companies approaching us to exhibit. That is the great thing about ToyCon, the scene and people are always changing, but we have the fantastic job of bringing it all to the UK. Blair: I think with the varied nature of the applicants you get a very strong range of products and offerings at ToyCon from exhibitors all around the world. The addition of Instinctoy is a big one for 2018 as they have had to change how they sell their items at many international events as a result of crowd control issues. Pock! Toys also promise to offer some of the best items coming out of Thailand for the first visit to ToyCon UK. TTC: Bethnal Green has been the Home of ToyCon for the past few years now; will we see any changes like floor plan to accommodate more vendors for this year’s ToyCon? Ben: We are keeping the floor layout roughly the same as previous years, as this gives us the most spaces available in the room. We are trying to utilise the other spaces fully for our events and custom shows. As they say, if it ain’t broke………. Blair: The floor plan is tough to gain a lot of space with, but we try our best to squeeze in as many vendors as we can with mostly adjustments to the table layout. Having exhibitors sharing spaces is a great way to encourage collaboration along with getting a few more artists in York Hall. TTC: ToyCon will be a two-day event again, this year we’ve seen you change the ticket prices which will definitely pull more attendees, have you guys got anything planned for two days like talks, live paintings and workshops? Ben: The main thing for our painting/workshops will be that they will all be happening on a Sunday. We really wanted to make the Sunday stand out and offer something different and with the Saturday being a little crazy, it made sense to dedicate Sunday to these events.We are trying something new this year with the live painting. We are having bouts, artist vs artist, over a limited time, which the audience will then judge by screaming loudest for their favourite! Plus, Matt Jones will be returning with his ever-popular toy making workshop but will be offering a couple of different types of workshop. Blair: We are approaching each day separately with Saturday being for the hard-core collectors and buying craziness, while Sunday is more for casual fans and also providing time to interact and participate more with exhibitors for a complete weekend experience. The activities are still in the planning stages but as mentioned the majority will be on Sunday so people can still get all their purchases in on Saturday and enjoy another full day of toys on Sunday. TTC: You’ve got artists and vendors returning and coming in from USA and Japan you must be proud to have them support ToyCon UK? Ben: Toycon is truly an international convention now. We love it that we can attract vendors from around the world and we hope that not just offering the best talent from the UK/EU, but with an amazing offering of international artists/companies, it really lifts the whole event to another level! Blair: I spend the majority of my time in Asia at the moment and I have the pleasure of attending a lot of the global toys shows and all the artists I meet know of ToyCon UK. It is very humbling to have respect on the international stage and with more and more exhibitors making the trip over it shows that we have earned that admiration and reputation. ToyCon UK also has a place of influence for artists gaining a following on the global toy scene such as Remjie and YoYo Yeung. Plus everyone loves having an excuse to visit London. TTC: With ToyCon UK growing list of vendors trying to get a spot at ToyCon any plans on moving to a slightly bigger venue in the near further to accommodate extra vendors and artists? Ben: We still feel that we are not quite at the stage to “go large”. ToyCon is still a very concentrated toy only convention and to go to a bigger venue would mean spreading into different types of art which could detract and take money from our traditional toy vendors. Blair: Every year we take a look at our venue options but in order to get more space the price jumps are significant and we are very concerned with keeping both ticket prices and booth costs similar year to year. There is no doubt we could have more exhibitors in a space but we also need more attendees to go along with that and the growth is not quite where we want it yet. TTC: Last year we saw and met plenty of collectors who travelled to England just for ToyCon UK. What would you guys say on what to expect for collectors and attendees this year? Ben: I think people can expect a delightful weekend of amazing toys from amazing exhibitors. That has always been one of my proudest things about Toycon is the super friendly and chilled atmosphere, that gives vendors the time to chat and just generally hang out with their fans. Blair: I think ToyCon UK offers a huge range of items, from one-off pieces to customs and even some of the latest soft vinyl releases so there is really something for everyone. The event also offers some of the only times for collectors from the UK and Europe to see items in person and even a chance to meet the artists as well. Plus for big collectors, ToyCon UK can offer a more casual experience compared to some other global shows with far less queuing, lotteries and disappointment. I imagine 2018 will have some releases that will make it worth the travel for collectors. TTC: Last year we saw plenty of mini customs shows which featured homegrown artists as well as global artists, will this year include mini shows? Blair: These shows are put together by the vendors themselves so we are not always aware of what is happening but we know of the ‘I am Board’ custom skate deck show being curated by David Stevenson. I would also be surprised if 1000 Toys and Martian Toys didn’t offer some sort of shows for 2018 given their past events. TTC: The T-Con is one of the most sought-after collectables from ToyCon, even overseas collectors have the annual T-Con on their lists of wants. Any teaser for this year’s T-Con? Ben: T-Con is an absolute star! The love he gets is really appreciated by us and we have a lot of fun dealing with the process of producing him. We are a way off for teasers though. Blair: Well we will probably be right to the wire on this one but we are hoping to have a few offerings for 2018, and even something new if it all comes to plan. TTC: What’s the biggest change that’s going to happen for ToyCon UK 2018? Blair: This is a tough question to answer as we cautiously try not to change too many items from year to year to keep the ToyCon UK experience similar. However, I feel that there is a fair bit of change in exhibitors this year which will offer a fresh feel to the event and also a better representation of where the toy scene is currently. Thank you to Blair & Ben and the rest of ToyCon UK team for taking time out talking to us. If you want to get your Designer Toy news first, you should look to download our new TTC Mobile App. Designer Toy news direct to your smartphone. No dealing with social media algorithms. Its FREE!